Mash 1 banana in a bowl using a fork, then beat in 50g of peanut butter and the maple syrup. Add the flour and then gradually add the milk and mix until smooth. Heat a frying pan, greased with a little sunflower oil and spoon the mixture into the pan (about 2 tablespoons per pancake). Cook for 2-3 minutes until bubbles appear and then flip with a spatula, cooking for a few more minutes. 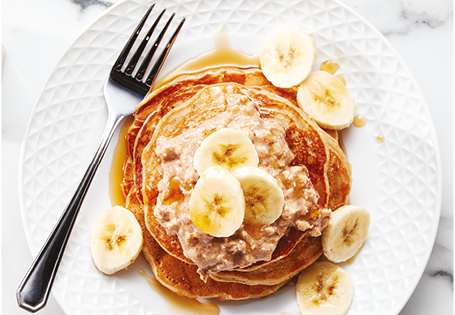 Serve with the remaining peanut butter, a drizzle of maple syrup and freshly sliced banana.